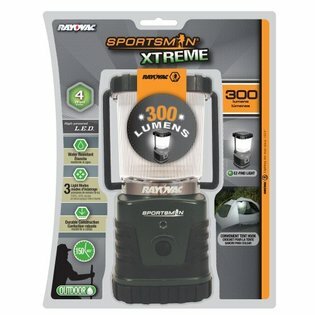 Emitting a bright 240 lumens at the highest setting, the compact yet powerful Rayovac Xtreme Lantern is perfect for blackouts, camping, your car, or anywhere you need strong light. Three light modes (low, high, strobe), twist-and-lift lens cover for wider light radius, convenient hanging hook. When the light is off, a blinking light helps you find it in the dark. Water resistant with durable rubber base. Energy-effecient LEDs never need replacing! Runs on three "D" batteries (included).